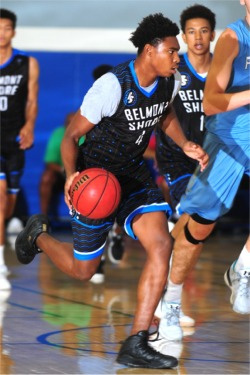 Fast-rising 6-5 2018 scoring guard Bryce Hamilton (Pasadena/CA) has committed to UNLV after considering offers from the likes of Ohio State, Arizona State, Utah, Colorado, Oregon, Washington, Washington State, Nevada, UC-Santa Barbara, UTEP, Santa Clara, Utah State, Portland and Buffalo. In 2016-17, Hamilton led Pasadena HS to a 27 win season, the Pacific League title and trips to the CIF-Southern Section Division I-AA and CIF Division II State Regional championship games - averaging 24.6 points, 8.2 boards and 2.7 assists per game. In the state Division II regional final, Hamilton had 31 points (22 in 2nd half). Those efforts led to Bryce being named MVP of the Pacific League, Pasadena-Star News Player of the Year and a 1st team All-CIF I-AA selection. Bryce was also invited this past summer to the prestigious Pangos All-American Camp in Cerritos CA and NBA Player Association Top 100 camp in Charlottesville VA.
Bryce is also a very good student, sporting a 3.4 GPA.